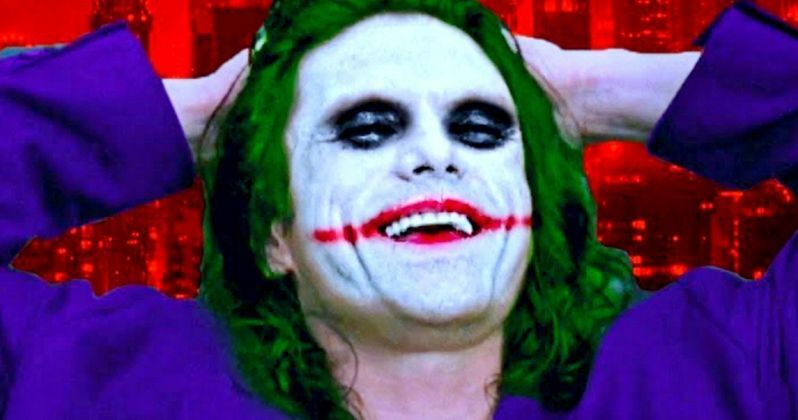 Tommy Wiseau is still campaigning to headline the Joker Origin Movie, and now we have some idea of what that might look like. Just a few days ago, the writer, director and star of The Room took to Twitter declare that he's interested in playing the Joker in the upcoming origin movie that Warner Bros. is producing. He asked Todd Phillips, who's set to direct this Joker standalone, to "DM" him on Twitter, as though this is something that could actually happen. Now, not only is Wiseau continuing to campaign for the role, but a fan-made trailer shows us just how crazy something like this could actually be. Starting with Tommy Wiseau's continuing campaign for the role as the Clown Prince of Crime, he shared art by SPDRMNKYXXIII that depicts himself as The Joker. The image takes most of its inspiration from Heath Ledger's take on the clown prince from The Dark Knight, but it also throws a little bit of Jack Nicholson flavor in as well. He may be a terrible actor, but Wiseau looks crazy enough to pull off something like this. He captioned the photo by confirming that yes, he does really want this part. "Yes! I want to be THE JOKER!" As for the trailer, it combines footage from The Room and The Dark Knight and, somehow, it works better than you might think it would. Still, this is ultimately a trailer depicting Tommy Wiseau as The Joker and he's going to be a serious downgrade from Heath Ledger. Naturally, the trailer manages to squeeze in, "You're tearing me apart Lisa," and Alfred's famous line, "Some men just want to watch the world burn." The whole idea of juxtaposing what is likely the best comic book movie ever made with what many consider to be the worst movie of all time is entertaining, but it still feels a little wrong. And the trailer ends with the ridiculous but kind of brilliant tagline, "Wiseau serious?" This is never going to happen, but Tommy Wiseau is certainly an ambitious dreamer. And can you blame the guy? After nearly 15 years, The Room was given a wide theatrical release recently and The Disaster Artist, a good movie about the making of his famously terrible movie, has been an awards season favorite and likely would have done better at the Oscars were it not for the sexual misconduct allegations made against James Franco. And let's not forget that Wiseau also wants to direct and/or land a role in a Star Wars movie. Warner Bros. is actually making a Joker origin movie and it sounds like it's going to be a high-profile project that takes place outside of the continuity of the current live-action DC universe. We recently reported that Joaquin Phoenix is the frontrunner for the role of The Joker in the movie. What's more is that Leonardo DiCaprio has met about the role several times. So they're quite serious about making this a prestigious project, with Martin Scorsese on board to produce as well. Sorry, Tommy, but this dream isn't coming true for you. Be sure to check out the fan art, as well as the Tommy Wiseau Joker trailer, courtesy of The Dangerous Brew YouTube channel, for yourself below.